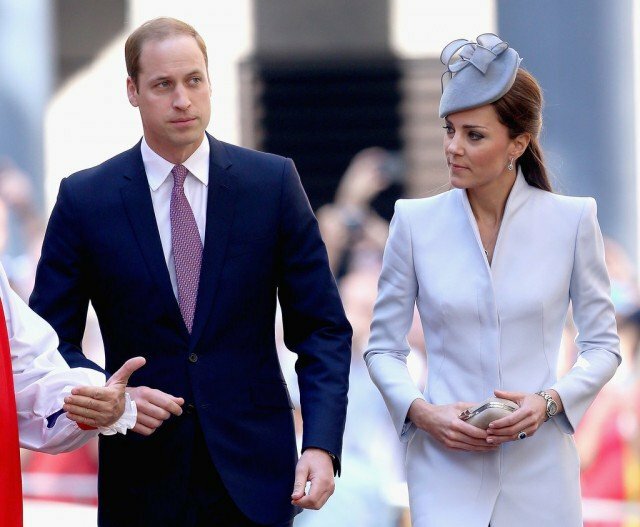 Prince William and Kate Middleton have marked Easter Sunday by attending a church service in Sydney. The Duke and Duchess of Cambridge were greeted by cheering crowds outside St Andrew’s Cathedral in the city centre. While at the cathedral, they signed the First Fleet Bible, which was brought to Australia in 1788 and bears the names of other members of the royal family. Prince William and Kate Middleton then moved onto Taronga Zoo, where Prince George was introduced to a bilby, a rabbit-like marsupial. Dressed in a blue striped shirt, blue shorts and black shoes, the young prince looked excited to meet the native animal, which was named George in his honor. Prince William and Kate Middleton then unveiled a plaque at the bilby enclosure, which was paid for by the Australian government to celebrate Prince George’s birth. Earlier, the private church service was also attended by Australian PM Tony Abbott. Archbishop of Sydney the Most Reverend Dr. Glenn Davies and Dean of Sydney the Very Reverend Phillip Jensen met Prince William and Kate Middleton on the cathedral steps before the service began. The bible had previously been signed by the Queen and Duke of Edinburgh as well as the Prince of Wales and Diana, Princess of Wales in 1983 on their visit to Australia with an infant Prince William. Prince William and Kate Middleton also signed the prayer book of the First Fleet – the 11 ships that carried Europeans to Australia in the 1780s. Kate Middleton wore a dove grey Alexander McQueen coat and Jane Taylor hat for the service, while her husband wore a suit. After the service, they spent time speaking to members of the cathedral choir and children who had gathered nearby to see the royal couple.